Diameter. 200mm.Width. 45-48mm.Min/Max Bore: 16/80mm.Wire Gauge. 0.30/0.35.Wire Type. Steel Crimped.Max R.P.M. 4,500. 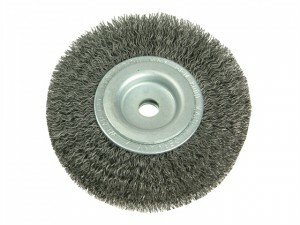 Stainless Steel Wire Wheel Brush for heavier applications and where ordinary wire would contaminate the work piece. Size. Diameter. 200mm.Width. 24-27mm.Min/Max Bore: 16/50mm.Wire Gauge. 0.30/0.35.Wire Type. Steel Crimped.Max R.P.M. 4,500. Diameter. 178mm.Width. 23-25mm.Min/Max Bore. 16/50mm.Wire Gauge. 0.30/0.35.Wire Type. Steel Crimped.Max R.P.M. 6,000. Diameter. 150mm.Width. 30-32mm.Min/Max Bore: 13/50mm.Wire Gauge. 0.30/0.35.Wire Type. Steel Crimped.Max R.P.M. 6,000. Diameter. 150mm.Width. 23-25mm.Min/Max Bore: 13/50mm.Wire Gauge. 0.30/0.35.Wire Type. Steel Crimped.Max R.P.M. 6,000. 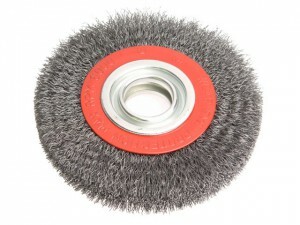 Diameter.125mm.Width. 29-31mm.Min/Max Bore: 13/40mm.Wire Gauge. 0.30/0.35.Wire Type. Steel Crimped.Max R.P.M. 6,000. Diameter. 100mmWidth. 20-22mm.Min/Max Bore: 10/30mm.Wire Gauge. 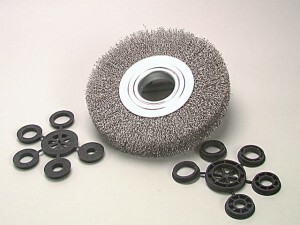 0.30/0.35Wire Type. Steel Crimped.Max R.P.M. 8,000. Diameter. 80mm.Width. 18-20mm.Min/Max Bore: 10/20mm. Wire Gauge. 0.20Wire Type. Steel Crimped.Max R.P.M. 10,000. Diameter. 250mm.Width.30-35mmMin/Max Bore: 20/100mm. Wire Gauge.0.30.Wire Type. Steel Crimped.Max R.P.M. 3,600.